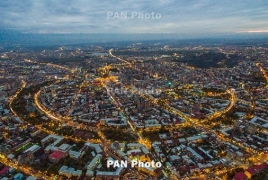 PanARMENIAN.Net - Yerevan is celebrating its 2798th birthday on Saturday, October 8. The capital and largest city of Armenia, Yerevan is one of the world's oldest continuously inhabited cities. Its history dates back to 782 BC, when the fortress of Erebuni was founded by king Argishti I. A cuneiform inscription proves that the Urartian military fortress was built at the site of modern-day Yerevan. The city is 29 years older than Rome, is the same age as Babylon and the Assyrian city of Nineveh, but unlike the latter, has become a prosperous city now. The city’s birthday has been celebrated since 1968, when the Erebuni-Yerevan events were organized for the very first time. This year, Armenia’s capital turns 2798, and its birthday is being celebrated under the motto “Yerevan: A City of Sun”. A great number of events for all the age-groups of the population have been organized throughout Yerevan. The fountain on a central square of the city of Yerevan in Armenia. The ancient but young city of Yerevan set to improve health systems through research and help bend the curve of tuberculosis incidence in Armenia. In the summer of 2018, I went on duty travel to Yerevan, the capital of Armenia, as part of my Programme’s work with a group of local researchers to finalize the papers which they had written following a year of research into critical aspects of tuberculosis (TB) control in the country. On day one, I caught sight of a billboard that said – 2,800 years of Yerevan, come celebrate with us. A quick Google search confirmed – forget Athens or Rome, Yerevan is even older! The history of Yerevan dates back to the 8th century BC, with the founding of Erebuni in 782 BC by the Armenian King Argishti I as a fully royal capital. Most of us who have lived or live in what is called the New World are usually fascinated by the sheer age of many European cities from the Old World. I panicked! What can I offer to colleagues who live in a city so old that there is a story soaked in every stone? Though a small country of just three million people, Armenia made global waves last spring with its Velvet Revolution– a months-long peaceful protest movement that eventually resulted in the resignation of the old government. This led to a snap election last December which was heralded as the first truly democratic election in the country since its independence from the Soviet Union. We spent a week of long days reviewing papers, finalizing data analysis, discussing what the findings may mean statistically and practically, helping to peer review each other’s writing and trying to understand what the findings may mean for decision-makers. The rates of TB in the country are alarmingly high, with high prevalence of drug-resistant TB (DR-TB) forms, complicated by socio-economic and health system challenges. Armenia is among the 18 high-priority countries fighting TB in the WHO European Region. Latest data show the main TB indices have declined, but the numbers are still above desired targets. Treatment outcomes are explained in part by the high prevalence of DR-TB forms. Despite successes in managing drug-susceptible TB and the fact that Armenia is no longer a high-burden multi-drug resistant (MDR) TB country, DR-TB still poses a major challenge to the effectiveness of the National Tuberculosis Programme (NTP). The Armenian researchers and practitioners who were part of this Structured Operational Research and traIning IniTiative (SORT IT) have set out to improve health systems through research and help bend the curve of TB incidence in the country. While the local TB problem was clearly identified by participants during the workshop, the solutions, they said, had to be global. May 2018: “I love Yerevan” monument on the Republic square in Yerevan downtown, Armenia. And global it felt all along – the 2,800-yearold city had a real palpable global energy. One of the local mentors, an Indian doctor from Chennai who decided to stay after finishing medical school in Yerevan, finding a job teaching internal medicine at the state medical university, didn’t seem to feel out of place or awkward, even with his accented Armenian. A Chinese business executive in the international health research centre that hosted us for the week was pleased there were Chinese restaurants in Yerevan, although she felt they lacked authenticity, saying that the Schezuan Beef she ordered time and again had a distinct Khorovats flavour (an Armenian barbeque). The war in Syria led to an influx of 22,000 Syrian refugees of Armenian origin which resulted in Yerevan adopting a new mentality as well as new cuisine. Many consider the culture in Armenia as being inclusive – another person joining a group or community is perceived as a positive. Armenians, like their South Caucasus neighbours, have long been renowned for their generosity to outsiders – a result of the country’s historical location on the Silk Road. The rich culture of the country is treasured and well preserved due in large part to its ancient history of being influenced by multiple empires, including Assyria, Greece, Persia and Ottoman-era Turkey. On my last day of seminars with the group, having finalized a set of over ten papers ready to be submitted for scientific journals, I learned that the German Chancellor Angela Markel was in town on an official visit. The taxi driver taking me to the airport told me she made a surprise walk on downtown streets of Yerevan to breath in the city’s 2,800-year-old charm. I wondered how much of this was typical taxi driver urban myth and so I looked for it online. Sure enough, there she was on video, walking down the street with the country’s leaders. Chancellor Markel made a comment that when she was doing her research studies as a student in East Germany she visited Yerevan as part of an exchange programme. But the days of East and West in Europe are now long gone. I debated what the title of this article should be; my dilemma being that most of us were raised hearing reference to the oldest cities of Athens, Damascus, Jerusalem and Rome, along with some other names of mysterious ancient cities which have long vanished, but Yerevan is never among them. My initial panic had now been resolved: if Chancellor Markel could feel at ease here and hold this beautiful old city in such high regard, celebrating its 2,800 year history, then so could I.